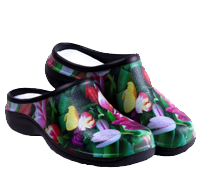 About :: Backdoorshoes...100% waterproof gardening shoes, lots of stylish designs and very comfortable to wear! As far back as I remember my wife, the kids and I spent so much time rushing in and out of the garden through the kitchen door in all weather getting soggy socks and then walking onto the carpets to find dark grubby patches appearing daily - always a bone of contention!! The situation intensified when after some time living on the beautiful island of Mallorca in 2001 we moved to a modest family 3-bed house in Bournemouth and decided in our wisdom to move work out of the house and into a large wooden hut in the garden. I was in my element, peace at last! I even insulated it and installed heating. As well as hosting my sacred office it had a dartboard and a running machine (which we did actually use). However, nothing had really changed with the soggy socks and slippers scenario... It was time to make a plan. I just needed a sensible pair of waterproof shoes to sit by the threshold of the back door in order that I could make the short trip to the hut elevated by just 3cm from the perils that ruin your carpets, slippers and socks.The whole point was that they needed to be easy on , easy off so not boots. I thought long and hard and eventually borrowed a pair of traditional medical theatre clogs from a friend. They were white, heavy and uncomfortable but most importantly to me at that time they were waterproof and I could slip them on and off in quicktime. The next 2 years saw prototype after prototype, my wife and I really put a lot of time and effort into designing the perfect and most comfortable Backdoorshoes® you see today here on our website. 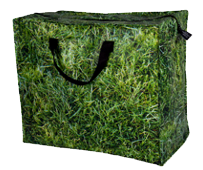 We officially launched in 2007 with just 4 patterns at BBC Gardeners World Live Birmingham to an outstanding reception. Many customers were in disbelief, especially given the odd patterns to include tomatoes, mixed vegetables and strawberries. 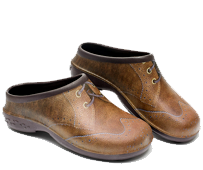 However, once we persuaded the visitors to try these odd looking lightweight shoes for size they were simply astounded by the practicality and indeed the comfort of these waterproof washable shoes. We continued to extend the range of patterns as well as sizes and registered trademarks to protect our simple idea :- Backdoorshoes®. "That’s exactly what they are!" said Chris Evans on his BBC radio show this year after he received a pair from his wife for Christmas. By the way Chris thanks for that.. we were having a rare quiet morning in bed in January when our home phone went bonkers with the news that you had been added as a fan. We are very grateful that you recognised the need and we really enjoyed the Carfest Events in 2014 also, we sincerely hope that we can work towards raising some dosh for Children in Need in 2015. We are without doubt exhausted by the journey so far, but it’s been a constant source of good feeling about what we do and why we do it. Our customer fan base grows daily and we are so grateful for that. It is odd to feel this way about shoes but our product gets a lot of love… I’ve never been involved with such a phenomenon. Customers regularly stop by our exhibition stands to say how happy they are and that our product actually changed their lives! Seriously, you can’t get a better recommendation than that! We have customers request to be on waiting lists for the next new designs... Some have purchased them all and many have converted friends and family to our unique Backdoorshoes®. Some claim that long term joint and foot problems have been resolved just by wearing them. 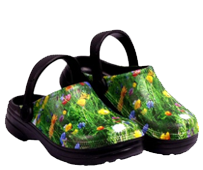 Whilst we would never make any medical claims that our Backdoorshoes® can actually cure illnesses we do claim they make you feel better and certainly keep you dry. Just ask any of our customers! Read what they say on the testimonials pages. Getting back to where we go next... we really don’t want to stop designing new patterns and it seems each new one brings a new adventure and opens avenues to new customers from different walks of life. We’re also in the medical clog business now (lightweight this time), we know many medical staff actually wear our patterns, and why not? You can never get depressed in a pair of Backdoorshoes®... when your head drops down the pattern normally makes you smile. I’m looking at my own faithful Chilli shoes as I write. Amongst our customers are veterinary nurses, surgeons, dentists, carpet fitters, electricians, builders, fisherman, gardeners, dogwalkers, physios, hairdressers and the list goes on. We love the business, we love our customers and we want to continue to keep feet dry and carpets clean so watch this space for the next whacky Backdoorshoes® designs and thank you so much for bothering to read this! Oh, and add yourself to our newsletter why don’t you? You'll see the sign-up box on every page. And just so you're sure, we never pass on your details.